Help your child learn to spell with this fun bathtime Alphabet Set, a must for your little one’s bathtime. These colourful foam letters stick to the bath or tiles and float in the tub. 65 letters, including duplicates with plenty of vowels to enable you to spell lots of words! The letters come in a handy net bag to let them drain and stay fresh after use! 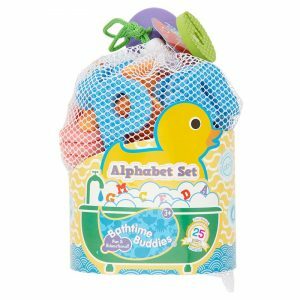 There’s lots of fun to be had with Bathtime Buddies Alphabet Set. Spell your child’s name, Mummy, Daddy, Grandma, Grandpa, Auntie, Uncle and so on. Familiarise your child with the letter shapes and new words! Available in Sainsbury’s, Tesco & Wilko.